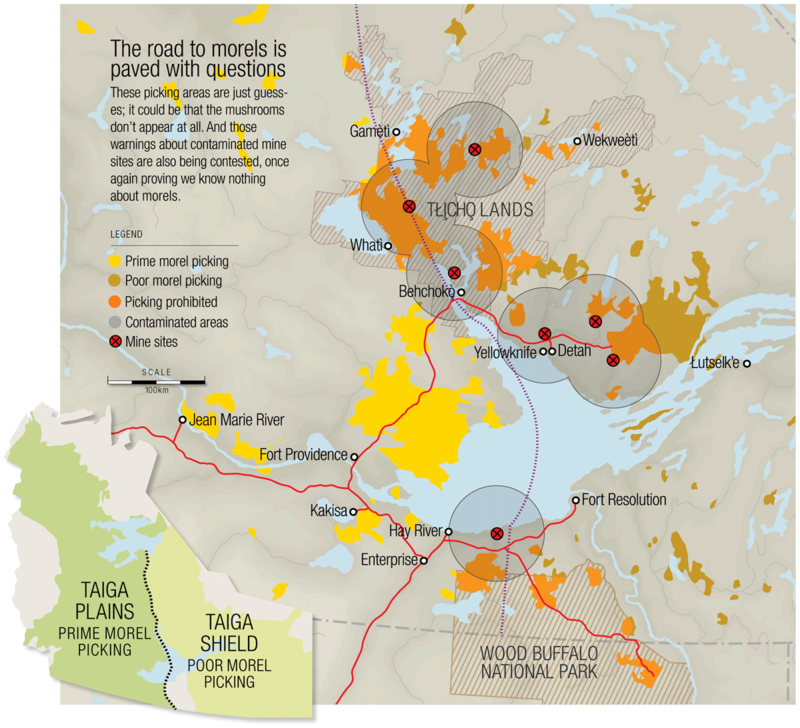 Mines: The GNWT is warning pickers not to forage anywhere within a 50- kilometre radius of Yellowknife, given the arsenic-ridden Giant Mine site. Mushrooms reflect the ground they grow on and for that reason, you shouldn’t pick up any mushrooms anywhere near old, contaminated mine sites. Besides, you probably don’t want to be camping near those sites anyway. Highways and communities: They make accessing burn areas easy, but you should be careful not to pick near them. It’s advised to go at least 200 metres into the woods from communities and highways to pick morels to avoid dust and contaminants. Don’t try to go deep into the burn areas with ATVs, though; burnt forests are fragile, and a falling branch could do severe damage. Tłı̨chǫ Lands: You need special permission from the Tłı̨chǫ government to harvest on their lands, and most of the burn areas on Tłıc̨ho lands aren’t accessible by road anyway. Shield versus plains: As soon as you cross the Frank Channel heading towards Yellowknife, you cross over into rocky Taiga Shield. This land is drier, with far less soil, which is why morels probably won’t grow as well on the shield as they will on the Taiga Plains to the west and south, where there’s more rain. National Parks: Only First Nations can harvest morels in national parks, and only for personal use. Wood Buffalo National Park was the site of some major burns, so even though those areas may look tempting, steer clear. Don’t: Use DEET, or any other bug spray; it could contaminate the mushrooms. » Litter, or leave any trace of yourself out there (other than morel stems)—people live, hunt, trap and fish on these lands. » Pick on private land. » Pick too close to other pickers—stick to yourself/your crew. DO: Make friends and partnerships. Buying stations are social hubs. You can meet veteran pickers and get advice, or just exchange stories. » Respect the land. Dene elders say if you are taking something from the land, you need to pay it back. This is traditionally done with a tobacco offering. » Let the local First Nations office know if you’re going out on their lands and understand that you are harvesting from their traditional home.